Jo Chun Ryong (Photo: Rodong Sinmun). Jo Chun Ryong (Cho Chun-ryo’ng) is a member of the DPRK National Defense Commission [NDC] and Chairman of the Second Economy Commission (Second Economic Committee), which is responsible for the production of conventional and advanced weapons. 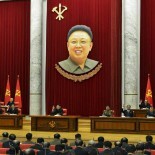 He is also a deputy (delegate) to the Supreme People’s Assembly [SPA]. Jo Chun Ryong (annotated) attends Jon Pyong Ho’s wake in July 2014 with senior members of the DPRK’s defense industry (left to right): Second Academy of Natural Sciences President Lieutenant-General Choe Chun Sik, former WPK Machine-Building Industry Department Director Ju Kyu Chang and former WPK Secretary for Munitions Industry Pak To Chun (Photo: Rodong Sinmun). Jo’s primary career experience has been as a manager in the country’s munitions and machine-building industry and eventually rose the position of director of a munitions factory. In late 2013 or early 2014, Jo was appointed Chairman of the Second Economy Commission, which manages the network of hundreds of factories involved in manufacturing and production in the DPRK’s conventional weapons, WMD and space programs. Jo formally replaced Paek Se Bong, who served as SEC Chairman for over ten years. Jo Chun Ryong was later elected a deputy (delegate) of the 13th SPA. Second Economic Committee Chairman Jo Chun Ryong (2) and Ri Man Gon accompany Kim Jong Un on a tour of the Sinu’iju Measuring Instrument Factory during September 2015. (Photo: Rodong Sinmun/KCNA). Jo Chun Ryong is based in Kangdong, Pyongyang and occasionally accompanies Kim Jong Un during on-site visits and field inspections. Like his predecessors, Jo’s presence in DPRK political culture is known in the few occasions in which he is a platform member at central report meetings and national meetings. Jo Chun Ryong has been a member of the state funeral committees for Jon Pyong Ho in 2014 and Ri Ul Sol in November 2015.